This started off as an official SPS trip lead by Larry Tidball and Greg Roach with Mirna Roach and Steve Eckert as participants. (Mike McDermitt joined us at Isberg Pass. Two people were no-shows at the trailhead so the rest of the wait list could not attend.) I signed out and continued on a private solo trip after Foerster. Driving through the rain and fog from the SF Bay area past Bass Lake to the Clover Meadow ranger station, I was wondering if the trip would be cancelled due to rain. Heavy rain at times, but no lightning. Then it cleared and I slept by my car without a tent. Few bugs and a full moon - it was looking good! We got kind of a late start the next morning, waiting for no-shows and caravanning from the ranger station to the poorly marked trailhead (see waypoints TRAILH and CLOVER, free camping at CLOCMP). The signs at various points along the road and trail refer to Isberg, Clover, Granite, Cora, and others... but at least from where we parked to "The Niche" there is only one trail. North of that is a multi-way junction that can get you lost in the muck of a meadow and stream. Most junctions are marked, but not all. The clouds built as we hiked, and the temperature dropped sharply around the McClure Lake junction. We donned rain gear and headed for Isberg Pass anyway. I threw in my trailhead tarp at the last minute, and wound up using it as both a poncho (over me and my pack) and rain fly (over my bivy bag). This was rain, not sprinkles! It lasted about 8 hours, until well after dark, with no complete breaks but also no thunder. Mike's "tent" was a 20+ year old nylon tarp with all sorts of tie points, which he graciously let the whole group share. It stopped most of the rain, but I sat on my bear cannister under my little tarp (tied between some trees) and watched their rain dances in relative comfort. High meadows where pixies gambol. Day 2 dawned mostly cloudy, but we started for Forester around 7:30 anyway. For a time it was sunlit dewey perfection (Erik waxed poetic about pixies gamboling amongst the flowers and trees), but as we neared the peak the clouds came and the temperature dropped again. The chute we chose was somewhat loose, and in the middle of a discussion about what to do if a rock slips the whole area around me moved... these were apparently stable rocks of 2 or 3 food diameters, but a couple of them went over the edge and broke up while I scrambled to stay on top and Mike scrambled out of the way. No harm done, but lots of noise and dust. We placed a new register and cannister on Foerster, then darted off to beat the weather. At the base of the chute, I signed off the SPS trip and headed north for Electra and Rodgers while the others headed back to camp. I think they made it before the rain hit. I went over the west shoulder of Foerster and down a boulder field into the Lyell Fork drainage, stopping at the 10000' lake due north of Foerster for a short nap in the sun. I awoke to raindrops and spent the next hour huddled under my tarp wondering if I should abort the trip. It rained about 15 minutes out of every hour the rest of the day, while I made my way up the drainage to the west face of Electra. The rock here is completely different than the Yosemite slabs/tundra where the pixies play: it's sharp dark slate that looks like the Chugach range where I grew up. 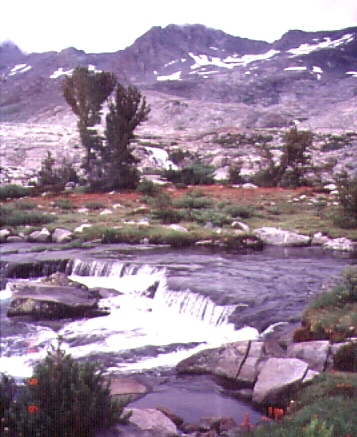 Wildflowers and a small waterfall in rough country (en route from Foerster to Electra). 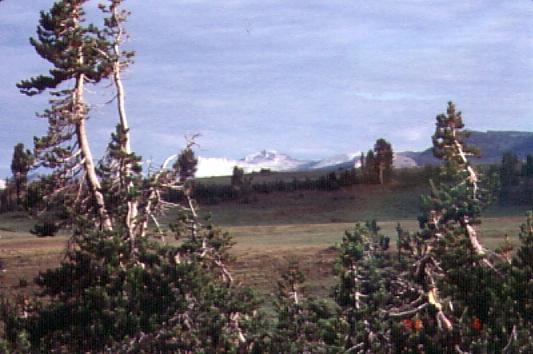 I camped at the 11000' lake NW of Electra, watching the peaks play hide and seek in the cotton candy clouds. The clouds won, and fog smothered the sound of my little stream just as it got dark. Dew ruled the night, but the clouds cleared a few hours before dawn. The morning of Day 3 I was walking as soon as I could see, lugging my pack up to the ridge just north of Electra (which is not in the guide books, but is a 12000' class 2 pass between the Lyell Fork of the Merced and the North Fork of the San Joaquin). From here it was a quick scramble to the summit of Electra, topping out at 7:30 am just as the sun was losing its battle with the clouds. There is a nice register box, but no register! Two slips of paper indicate people with pencils climb this peak about twice a year, and I added my name to one of them. Dropping into the NE cirque from Electra, I traversed to the SE face of Rodgers but didn't like the snow and loose steep rock above them. Being alone and with monsoon clouds above me, I took a defensive route down to the drainage east of Rodgers with my full pack, then climbed the north side of the east ridge. From here I was close enough to water and campsites that an aborted peak climb would not force me to carry my full pack very far on wet rocks. The weather held, however, as I kicked steps up a thousand feet of snow to the ridgeline. This route is rated class 2-3, but any class 3 is well hidden under the snow! 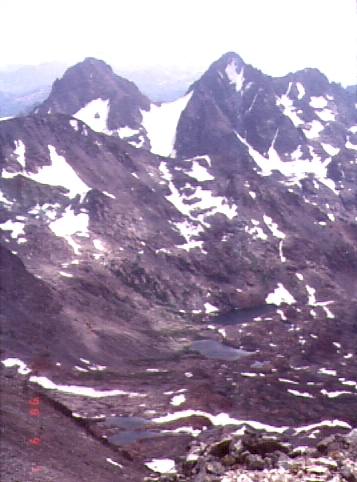 The seldom-seen west side of the Ritter/Banner saddle, and the North Fork drainage that leads down from Catherine Lake to Hemlock Crossing, from Rodgers Peak. Back at my pack, and with improving weather, I headed to the 10200' lakes SW of Davis. Could I get all three today? It was 2pm and I was less than a mile and only 2000' from the summit. Time to eat and scope out the route, but the now-familiar cold wind hit the back of my neck and curtains of rain pulled across the valley behind me. I ran. It's beautiful in the drainage above Twin Island Lakes, but by the time I got out from under the rain (Rodgers was the epicenter, and remained in clouds the rest of my trip) the mosquitoes ruled the valley. The sun came out and I dried my gear while I had an early dinner, then hiked on down to Hemlock Crossing (waypoint HEMLCK) in heavy bugs just as it got dark. This place has one of the most amazing (short) waterfall and diving pools in the Sierra. Overnight a crazy plan formed: I would try dayhiking Iron Mtn from Hemlock Crossing instead of just hiking out. Leaving at first light on Day 4, I followed the trail across Iron Creek toward Corral Meadow but cut off at the second high point (about 8300', waypoint XCORAL) where I could head due east and bypass the west shoulder of Iron. This shortened the day by about 10 miles, but could have lead me into cliffs or brush. It turned out to be a GREAT route, with open walking and occasional water. Be sure to stay on the vague ridge NORTH of Naked Lady Meadow for the easiest walking. I went past Straube Lk and back onto the trail just south of Alstot Lk (waypoint IRONTR). From Alstot the 15' map shows a trail heading up the south face of Iron, ending east of the peak. Imagine my surprise when I found the trail went all the way to a saddle! Imagine my FURTHER surprise when I found the trail went west of the peak, leaving me with close to a mile of ridgeline to run. It's not good footing after the saddle, but a good trail goes right over the saddle to a lake on the north side of the ridge. On the ridge I found a mine shaft which has been filled in but would serve as a great bivy site for 3 or 4 people (waypoint MINESH). On the summit around noon, the clouds headed my way and I headed back to Alstot Lake by dropping directly south of the summit. Much easier walking! It was raining by 4pm, but I sat it out under a tree and still made it back to Hemlock around 6pm (12 hours and 15 miles for the day, so far). The clouds did not clear, and I could see distant lightning starting, so I packed up after dinner and headed for the car at 8pm. It didn't rain again until almost 9pm, but then it was continuous thunder and occasional showers all the way to the car at 2am (25 miles and over 6000' of gain for the day), continuing until I drove to lower elevation by around 4am. The last 2 hours of hiking were biblical. Thunder and lightning, periods of cold wind interspersed with warm calm and the occasional shaft of moonlight poking through. Near the end it wasn't a shower, it wasn't driving rain like we had at Isberg Pass, it was time to build an ark - this was God's Vengeance On Man, and I alone was the target. I could not see the trail because there was so much rain that my headlamp glared back at me like high beams in the fog. I sat under a tree, which worked for about 2 minutes until the branches were saturated. I sat under my tarp under a tree, which worked for about 10 minutes until the ground became saturated. I put on a sweater and gritted my teeth, falling asleep under the tarp only to wake when the noise abated half an hour later. I finished the hike in what would normally be considered hard rain, and drove to Oakhurst in fog and rain for breakfast. Four peaks in four days, with many incredibly varied drainages, and weather from dozing in the sun by a tarn to dozing in the rain under a tarp - tramping describes the trip better than climbing, but mountaineering is about overcoming obstacles (even the weather). See the trailhead page for driving waypoints!